We have been raising white doves for more than 30 years. Based in Staten Island, N.Y., we have put our experience to work, pleasing crowds and party goers in the Metro New York and New Jersey area. 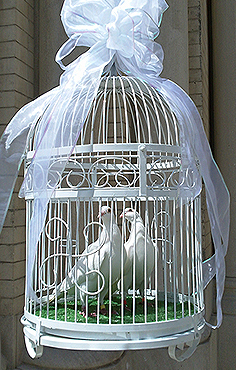 Our white dove releases make a special addition to not only a wedding but also for a memorial and other events. Our experience is not the only thing that sets us apart from our competitors. The coordinator who arrives at your party is the very person who trains the birds, feeds them and takes care of them on a daily basis. Personal service is the trademark of Love Doves, and will help ensure a seamless release that will delight every guest. Our coverage area includes the five boroughs of New York City (Manhattan, Queens, Brooklyn, Staten Island and the Bronx), Westchester, Long Island as well as all of New Jersey. When you choose us, you can be confident that you are getting the best in the business!